When you’re a mom, strollers are a big deal. What’s the ride like? What type of tires does it have? How easily accessible are the brakes? How does it do off road? How easy is it to open and close? How big is the undercarriage? I mean, it’s serious business. 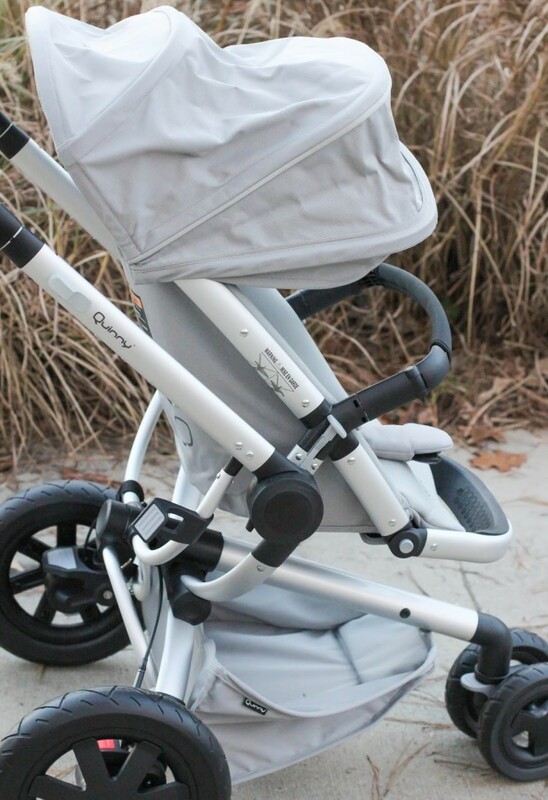 That’s why I was really excited to review one of the highest rated strollers out there – the Quinny Buzz Xtra Stroller . 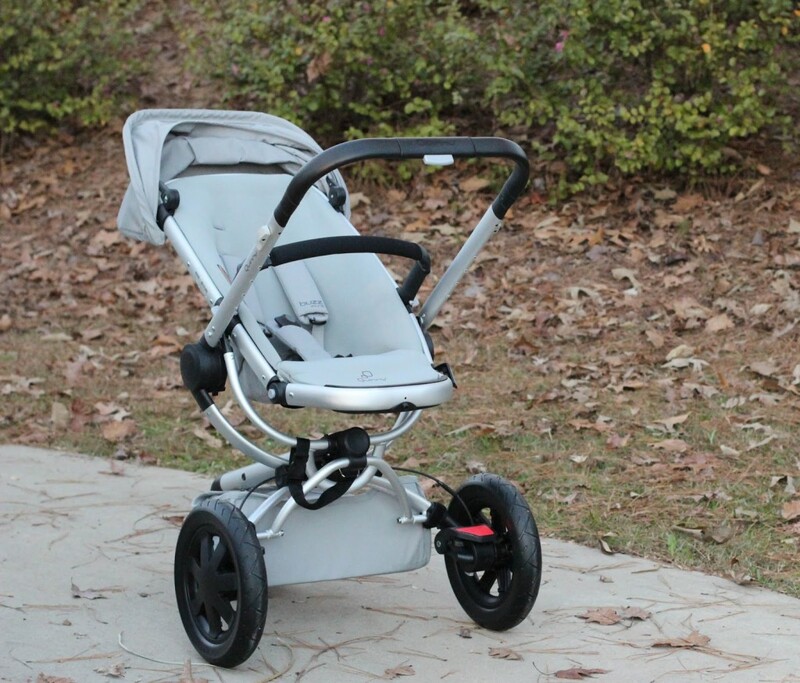 The Buzz Xtra is an all-terrain, full feature stroller that has a lot of great qualities. For starters, this is a really nice looking stroller. It’s modern, sleek, the perfect size, and comes in several pretty colors including the Grey Gravel pictured here. It was easy to put together right out of the box which was great as I clearly wanted to get started using it right away. The handling of the Buzz Xtra is impeccable. 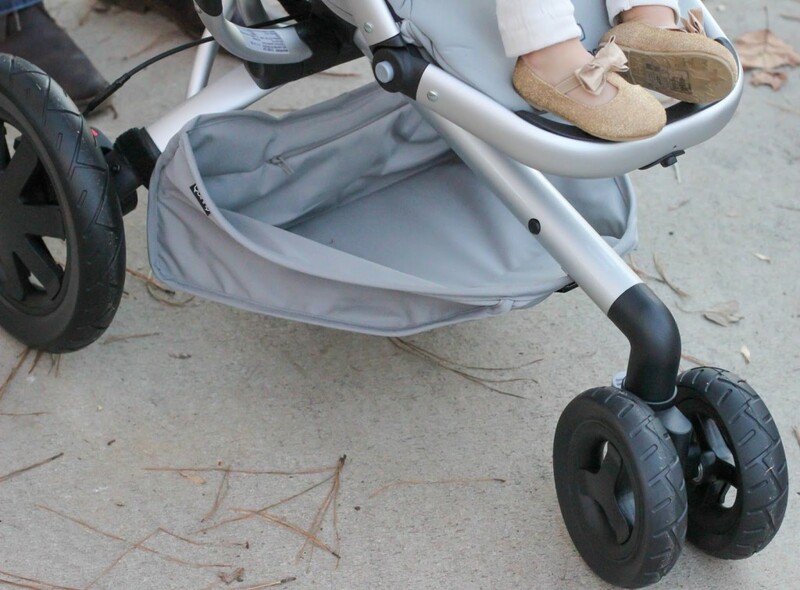 The stroller boasts never flat all-terrain tires which give an incredibly smooth ride, and has two back tires and one front tire that swivels or locks. The turning radius of the stroller is amazing. It’s now my favorite stroller to take shopping because it’s so easy to navigate around tight spaces in stores based on it’s size and turning ability. Another aspect to the Buzz Xtra that I love is the brakes. There is a red pedal for braking and a gray one to take the brake off. They are both really easy to push making it great for situations where you are stop and go, aka why it’s my favorite stroller for shopping. 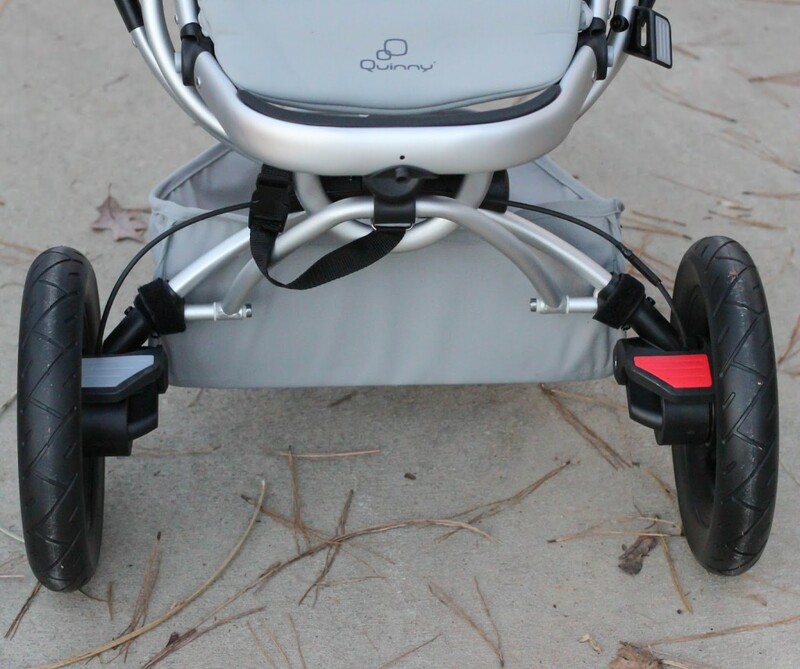 And for all the taller mamas out there the Buzz Xtra has a great height adjustable push bar that adjusts really easily. The Buzz Xtra is on the heavier size, but I’m able to get it in and out of my car with no problem so that doesn’t bother me at all. I love how compact it becomes, and that it would easily fit in the trunk of a small car. The stroller is incredibly easy to open and close and it does both of them quickly, making it easy to pack up your stuff and get on the way. It just takes one push of a button and the stroller unfolds automatically due to hydraulics which is pretty remarkable. It does take two hands to close, but it closes easily and with the seat attached. The fact that the seat faces both forward and backwards is major to me. As a younger baby I always wanted to have Maddie Grace facing me, and she also enjoyed this way more. As she’s gotten older it seems she tends to enjoy facing forward more, but sometimes, especially when she’s sleepy, it’s better to have her facing me while I push her. The seat is super easy to switch from forward to back as well. You can purchase a car seat adaptor to turn the Buzz Xtra into a travel system or purchase a bassinet for young babies. This is a single stroller however and has no option of converting into a double stroller. The undercarriage of the Buzz Xtra is good, but not great. In other words I have strollers with worse, and I have strollers with larger ones. Given, a larger undercarriage would mean a larger stroller which would be more difficult to navigate in tight spots so there is a reason why it isn’t larger. I do love that the undercarriage is easily accessible from all sides though making it a great place to store a few items when on the go. The seat for the Buzz Xtra is very plush and appears very comfortable. The seat reclines, although there are only 2 recline positions, but that seems to cover your basics for awake child and sleepy child needs. I love that there is a large canopy on the stroller so it’s great for taking out on hot days, that has a retractable visor for extra coverage. The one thing that the canopy lacks, however, is a peekaboo window. I don’t use it much on other strollers at this point because MG is older and I can tell if she’s awake or asleep, but I think if she was a little younger it’s a feature I would miss. 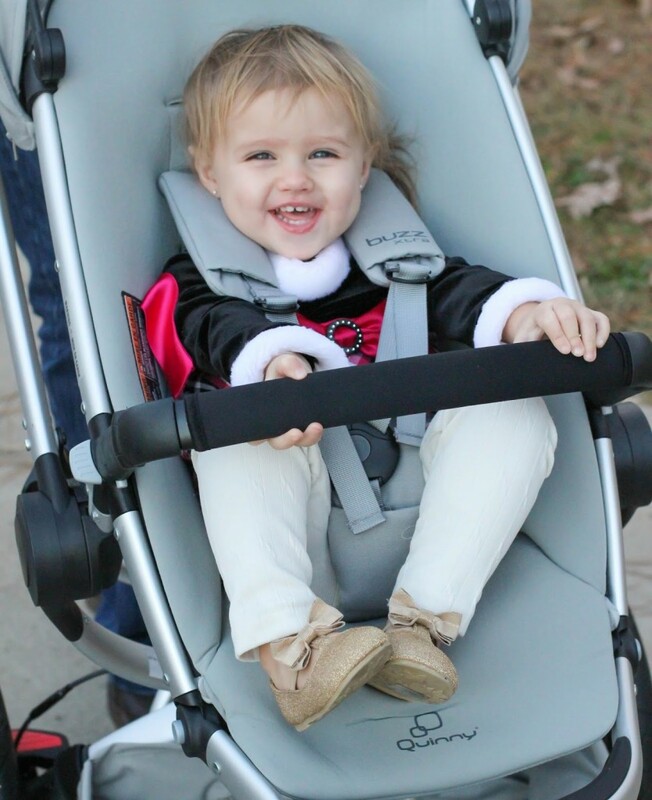 The five point harness on the Buzz Xtra seems both secure and comfortable for children, and I appreciate that there is a bumper bar to keep baby from running into anything or jumping out too easily. It’s also important to note that the fabric wipes clean very easily, which will make moms very happy. One thing to note is that the Buzz Xtra does not come with any extras either for mom or baby – no cupholders, snack tray, etc. 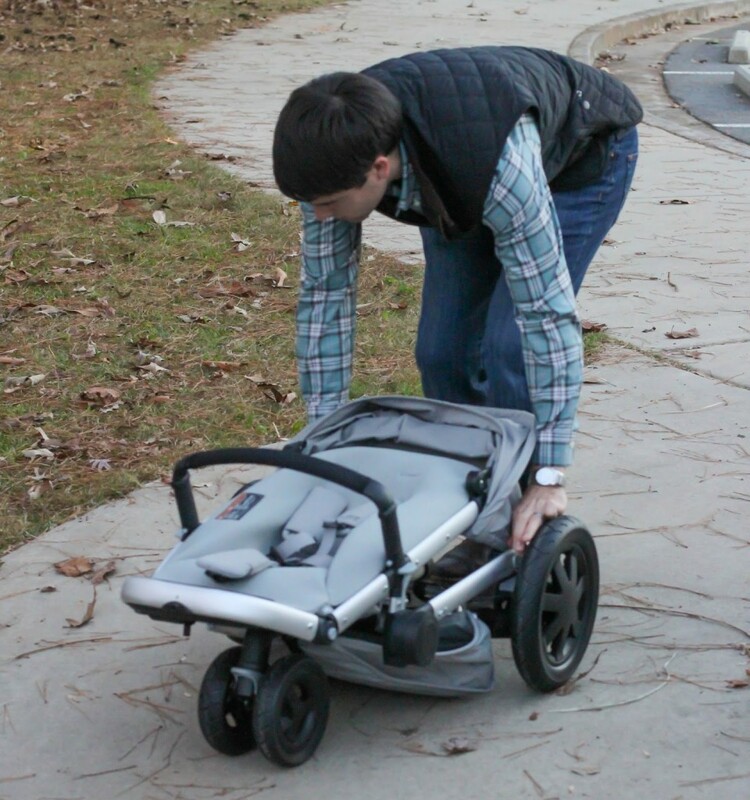 – but almost all high end strollers lack this and require that you buy them separately. You can also purchase a rain cover, footmuff or parasail for the stroller for extra comfort for your little one. The stroller fits children up to 50 pounds so they can ride in the Buzz Xtra for a while. There is also great footrest for the children that has multiple positions for your child’s comfort. The one thing I have noticed though is my 19 month old, who does have really long legs for her age (size 3T pants fit her perfectly) has her legs dangling over the edge of the stroller as she has to bend her knees up for her feet to sit on the footrest. This doesn’t seem to really bother her though. I love this stroller and think that it is a great luxury stroller at a great price point [$469 on sale on Amazon ]. 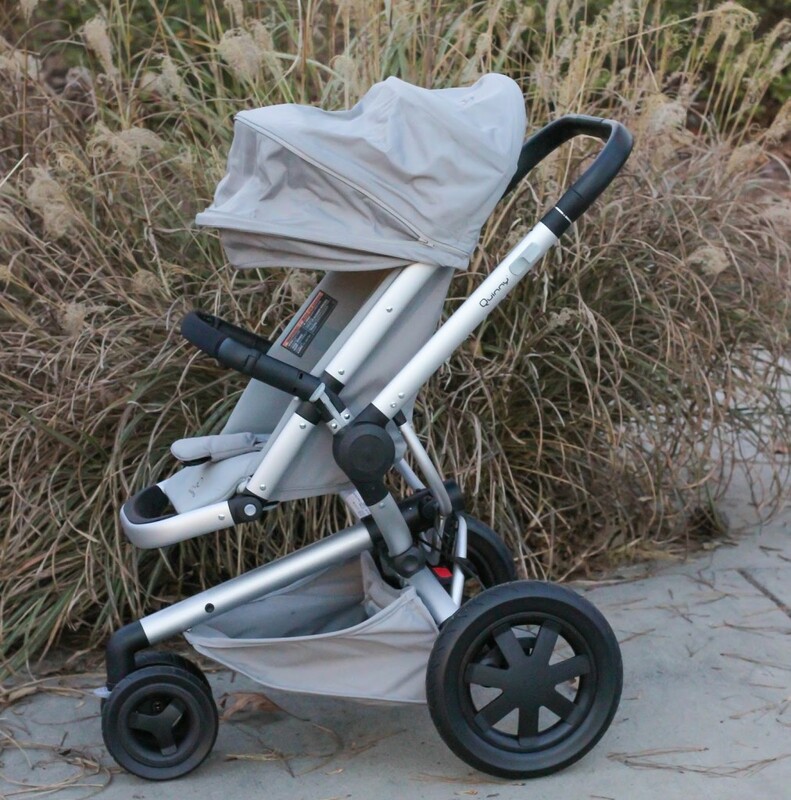 Any mom who enjoys shopping (and what mom doesn’t) or just wants a versatile stroller that’s easy to open and close and that can go on and off road would be happy with this selection. 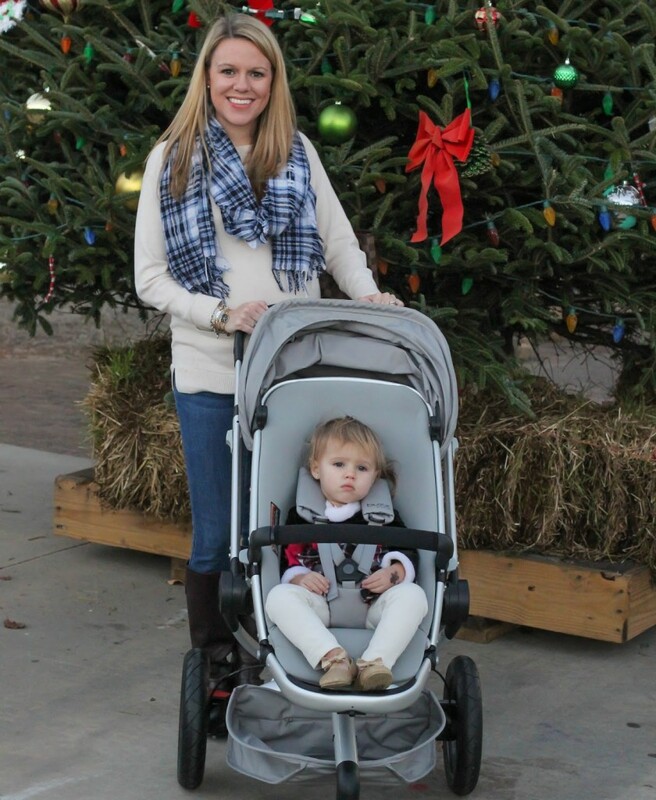 Don’t forget that you can win a Quinny stroller in the big New Mom Essentials giveaway here! I love the looks of it and you look so adorable! Oh my!! I have been looking for a stroller that can have my kid facing me, because I am Deaf. This is just perfect!! I will definitely keep this on my baby list for when I have a second baby. very handy and nice one! seems perfect. I like the design and that it is so easy to put away! 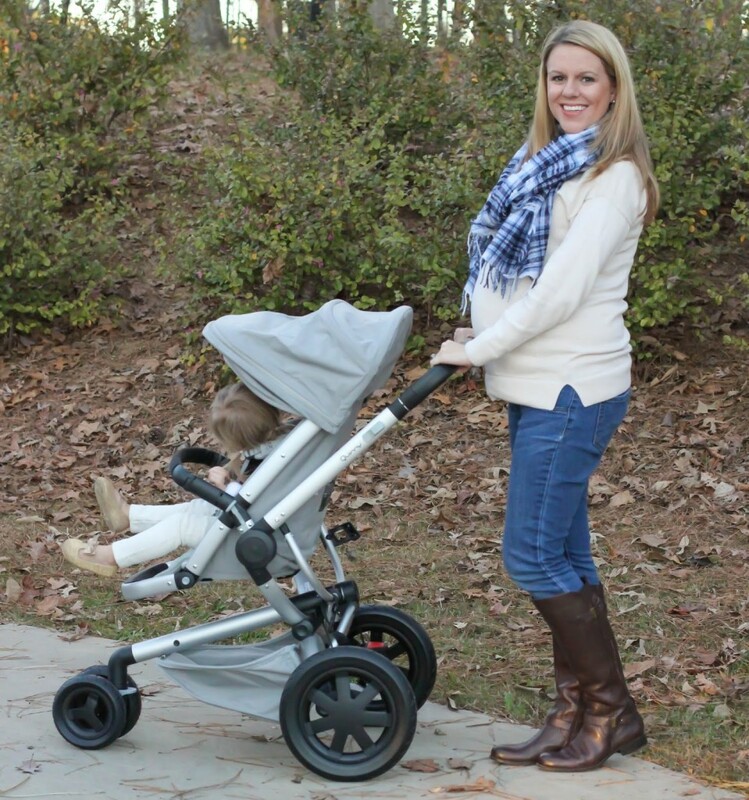 What a gorgeous stroller, how nice that you got to review ti! I agree, a stroller is a big deal when you're a mom! 🙂 Love the color too! The design is so sleek and modern. Your baby looks so happy sitting in this stroller!